After a successful weekend plan, the team decided that for the sol 1991-1992 plan, we would trade a longer-distance drive in favor of some "touch and go" contact science. This ensures that we have a good record of the variations in chemistry and rock texture as we drive along the Vera Rubin Ridge. The plan starts with a short APXS observation of the target "Seaforth Head" along with MAHLI images of the same target. ChemCam and Mastcam also join in the fun, analyzing Seaforth Head as well as the target "Canisp". 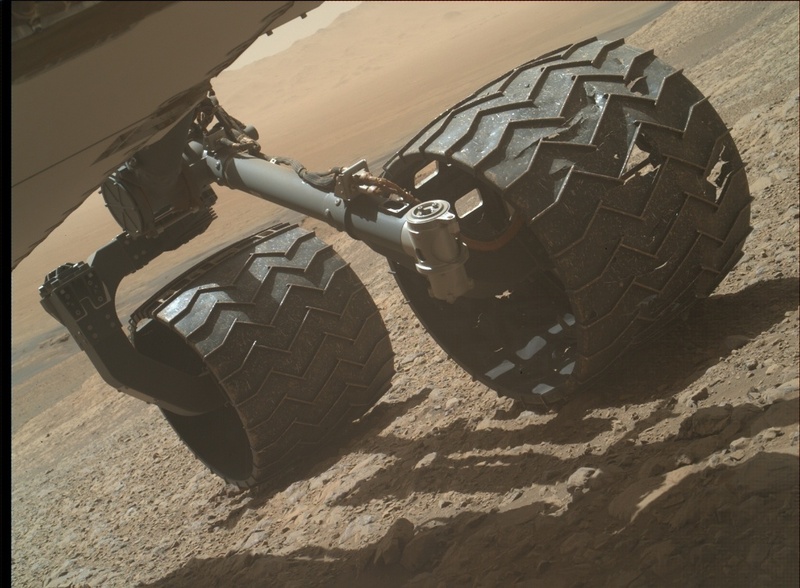 After those observations are finished, Curiosity will drive about 15 meters and collect the usual post-drive images. On Sol 1992, we have an untargeted science block full of ChemCam activities. ChemCam will use autonomous targeting to analyze a patch of bedrock, and then will observe the titanium calibration target. After that, ChemCam will take advantage of the clear skies and nice vantage point here on the top of the Vera Rubin Ridge to do a big 10x2 RMI mosaic of part of the Peace Vallis fan. Mastcam will observe the same area with its right eye to provide color and context for the RMI. The plan wraps up with a Navcam movie to watch for clouds.